A Louisiana congressman has apologized for making a crude joke about White House adviser Kellyanne Conway. Democrat Cedric Richmond made the joke during a comedy routine at last week's annual Washington Press Club Foundation congressional dinner. 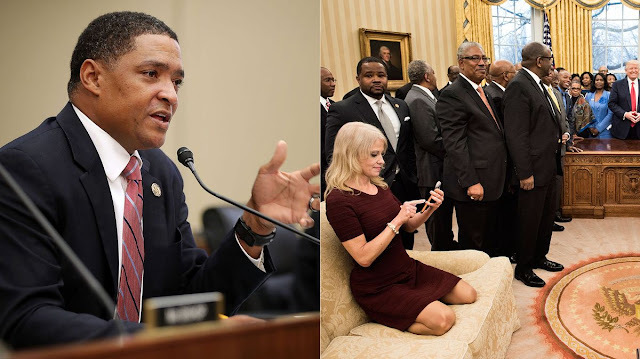 Citing the picture of Conway kneeling on a couch in the Oval Office, Richmond said Conway looked "kind of familiar there in that position." The joke fell flat as the room full of journalists, congressional staffers and politicians audibly groaned. Richmond initially defended the joke, saying his use of the word "familiar" simply meant that Conway looked too comfortable. But Sunday night he issued a statement apologizing for the joke. "After a discussion with people I know and trust I understand the way my remarks have been received by many," said Richmond. "I have consistently been a champion for women and women's issues, and because of that the last thing I would want to ever do is utter words that would hurt or demean them. I apologize to Kellyanne Conway and everyone who has found my comments to be offensive."